Chase Wrenn, a professor in the philosophy department, teaches an online Intro to Deductive Logic course centered on building skills in formal reasoning. 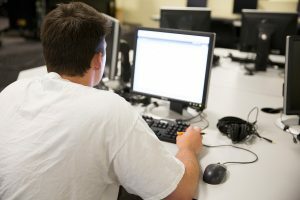 He offers the following advice on managing self-paced, asynchronous online courses. What tips do you have for providing effective feedback online? Be prompt and detailed. As an online instructor, there is a lot of asynchronous communication with the students, so it’s important to give students very detailed feedback and err on the side of more, rather than less, detailed feedback. You also want to be sure the students get your feedback in time for it to be useful for them. I have time set aside every day for looking at student work and emailing them with detailed advice on how to improve it. How do you keep students engaged in the online environment? This is an ongoing challenge for me. I rely on my students to be self-motivated, but it’s good to give them frequent encouragement to continue working. My own course is built around a large number of online practice problems that the students use for drill and practice. Passive consumption isn’t possible, because they have to practice solving the sort of problems they’ll be tested on to have any hope of succeeding on the test. Every week, I email the class with a reminder of how far along we are in the course and some guidelines about how far along they should be to be on pace for a good grade. The idea is that this will help them remember they have work to do and help motivate them to do it. What advice do you have for first-time teachers of online courses? Make sure you maintain the same attitude to your online course that you expect the students to have. You probably expect your students to dedicate a lot of time and thought to their work on the course. You should too. That means making it clear, through your prompt replies to emails, reminder announcements to the class, and feedback on student work, that you yourself take the course seriously and want to help them succeed. If you don’t do that, or if you blow off the course or give it half-hearted effort, then the students will do the same. They’ll do poorly, and they’ll likely be unsatisfied with the course as well. Wrenn is an associate professor in the Department of Philosophy and the director of the department’s mind and brain specialization.